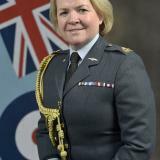 Air Commodore Maria Byford joined the Royal Air Force in 1991, following graduation from Kings College London with a Bachelor in Dental Surgery. Over the next 17 years, she delivered military dentistry in primary care dental centres and military hospitals in the mainland UK, overseas in Northern Ireland and Cyprus, and whilst on deployment in the Middle East. Towards the end of this time she was appointed the RAF Dental Branch recruitment officer, and developed a passion for vocational training and the development of junior Dental Officers. In more recent years, Air Commodore Byford has been serving in Command & Staff roles within the Defence Medical Services, initially as SO1 Manning & Commitments in the Directorate of Medical Operational Capability. After a year on Advanced Command and Staff Course she took up appointment as Military Assistant to the last Deputy Chief of the Defence Staff (Health) until his retirement, followed by a post in the Inspector General’s team at HQ Surgeon General. On promotion to Group Captain in 2011, she became the Head of Personnel Division within HQ Surgeon General, and was Project Director of DMS 20; a critical change programme that defined the future medical operational capability needs of the Defence Medical Services. In 2014 she deployed as the final Commander Medical Joint Force Support (Afghanistan) on Op HERRICK, and was responsible for the closure of the Bastion Role 3 Trauma Field Hospital and the safe recovery of the UK Medical Group from Afghanistan. On return from deployed operations, Air Commodore Byford took up the post of Commander Medical (RAF) in January 2015, providing medical operational capability in support of air operations in peace and crisis. Her appointment was short lived as she was selected for promotion a few weeks later, and was appointed Head Future Healthcare within HQ Surgeon General with effect from March 2015. In her current role she is responsible for innovative concept development, high level planning and strategic commissioning for healthcare delivery and training, and she leads on collaboration with the UK National Health Care Executive. She was delighted to be appointed Queen’s Honorary Dental Surgeon in December 2016. She is married to Alistair, a recently retired Air Commodore, and they have 2 university age children, Will and Charlotte. Together they enjoy skiing, sailing and spending time at their holiday home on the Suffolk coast.